As April comes to a close I want to take a moment to thank our sponsor for the month, Laundry Angels. I'm really happy we were able to share the service Michael and Nina have available for their fellow Madison residents. This service isn't just offered to Madison residents by just anyone... the business is run by one of your Madison neighbors! I love being able to support local! We've heard awesome reviews from neighbors that have given Laundry Angels a try... and can't imagine not having their laundry taken care of any more. 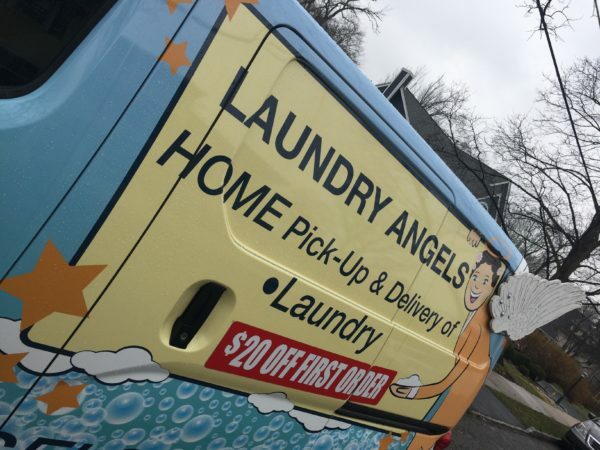 If you've been thinking about starting to use a laundry service... take a moment to check out Laundry Angels. It’s a long way from Hotel School of Amsterdam graduate to the launching of Laundry Angels, his home-laundry pick-up and delivery service, but along the way Michael Hoskam, owner , has learned the expertise of customer service and attention to detail. Starting with summers training on the Holland America cruise ships, to being noticed by a passenger who offered him a job at the 21 Club, which he owned; to being offered a country club manager’s position in Maryland in his 20’s; recognizing and taking advantage of opportunity when it knocked has been the pattern of his life. For most of his adult life Michael had served as general manager at prestigious clubs from Maryland to Forest Hills Tennis to Long Island and New Jersey. After retiring he and his second wife, Nina Ratzrnan were then able to enjoy a leisurely life of golf, travel and NY. dining. After a while, though the itch to get back to work needed to be scratched. Trained as a sommelier and having his own wine cellar, a natural choice was a job in wine sales.Traveling the roads of NY. and NJ. -pre GPS- in search of liquor stores to call on, he met many business owners, and this led him to start BSB Brokerage helping people who wanted to buy or sell a business. A phone call one day from two doctors, who were partners in a Laundromat, led him to the hills of Sussex County. What he found was a 4 yr. old state of the art facility with 70 washers and dryers in a small shopping center. Sadly one of the partners was dying of cancer and the other never had any involvement. The “manager” came only to collect money, there was pilferage, and neglect (1/4 of the machines said “out of order”and 1/2 the lights were out) This was a situation where “the lunatics were running the asylum!”Customers had drifted away. As the price continued to drop, recognizing the potential in this neglected “child”, Michael came home one day and said, “I think I need to buy this place.” He and Nina agreed , and so Laundry Dr’s became Suds City where today a staff of four work in a well lit colorful facility filled with flowers and artwork where customers come to take a break from the stresses of life to enjoy the surroundings while doing Laundry!!! Having trained staff to provide quality wash and fold, in addition, this part of the business grew ten-fold over four years. Expanding to pick-up and delivery of laundry was a natural next. A Madison resident for 13 yrs, Michael had. made many friends whom he felt could use a service in Morris County geared to two career couples , stay-at-home moms and working singles that relieves the burden of doing laundry And so Laundry Angels was born.. When you see a van covered in bubbles with a winged angel, that’s Michael still trying to help people ease the burden of life’s stresses still providing useful and meticulous customer service this time doing laundry. Laundry Angels does your Laundry at Suds City Laundromat in Sussex Boro NJ. Suds City is a 5 Star Facility and has 70 stainless steel, state of the art, electronically controlled washers and dryers. We are expert Laundologists that will take out most spots on clothes and other laundry items if you let us know what caused the spot. Make sure to let us know in the comment box. $29.00 for the first 20 lbs of laundry, and $1.70/lb after that. Charges for comforters, blankets, doggie beds, sleeping bags, bathroom rugs are separate as per sheet. Check out the full pricing list. 20 pounds of laundry is approximately a week of laundry, including bed linens and towels, for a working couple. First time customers get a $20 discount. If you have any questions, please give us a call at 973-702-8765. We are available to chat 7:30 AM to 7:30 PM 7 days a week. You can also contact us online if you prefer. For your convenience, our online ordering system is available 24/7, so you can place an order at any time! We pickup on Monday mornings, and drop back off by Wednesday evening.